Basketball star A'ja Wilson is getting a statue at South Carolina. University President Harris Pastides closed graduation ceremonies Saturday by announcing the school plans to build a statue of the national player of the year. The project must be approved by the school's board of trustees. How many other college athletes have statues of them on campus? She's a great player, but this seems a little much. A bit much...but whatever floats their boat. If that’s the case, then perhaps UConn should erect statues of some of their star players (Lobo, Taurasi, Bird, Cash, Dolson, Moore, among others), as well as Coach Geno! An article or announcement of this sort is normally published on the first day of April on some Clemson sports forum. SMH. Rather than just honoring their school's greatest WBB player, is this more an attempt to bolster the program's prominence, gain publicity, and aid recruiting? Unlike some schools, South Carolina doesn't have a bunch of national championships. The WCBB one from 2017 was only the 4th in school history (two in men's baseball and one in women's outdoor track & field). Seems a bit much, but since this doesn't actually affect my life in any way, I have a hard time working up much in the way of Internet Outrage over it..
Why should this bother or offend anyone, especially on a site devoted to female basketball players? As pilight has pointed out, Wilson was perhaps SCar's most successful athlete, and a local palmetto gal to boot. Springfield College has a statue of James Naismith. Notre Dame has a statue outside its basketball stadium of former athletic director Edward "Moose" Krause smoking a cigar. 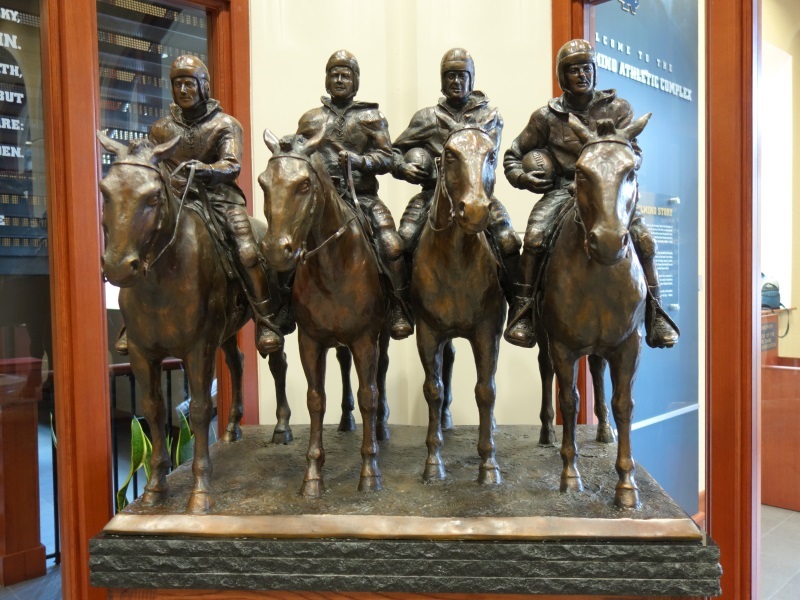 Elsewhere, they have statues of Rockne, Leahy, Parseghian, Holtz, Mary and Jesus. Outside its basketball arena UConn has a statue of a dog named Jonathan. Georgetown may have a statue of a Hoya, draped in mystery. To me the fact that South Carolina, a state not exactly known for its commitment to diversity, will have a statue of an African-American female basketball player on the grounds of its flagship state university is much bigger than basketball. Anyone that can't see that, is as much as I hate to use the term " a hater" plain and simple. This should be something to be thrilled about. In what world is this a bad thing? I didn't see where anyone was outraged, bothered, offended, hating, or anything of the sort. Read some of the first few posts . It also sort of implies that SC doesn't think they will ever have another NC or NPOY ever again. Sort of silly if you ask me. Having a statue of your first doesn't seem that odd. A Lobo statue would be appropriate for UConn. ETA: Even if it was a statute of my ALL-TIME favorite Huskie, Moriah Jefferson. There are thousands (a million?) of statues spread throughout the United States. Of those many monuments, the majority were erected to honor white men. Personally, I celebrate the effort to erect any statues that celebrate women and people of color. With all of the controversy surrounding the removal of statues, especially in the South, I find it odd that this move is not celebrated more widely. But what about Kerry Bascom? Which horse is Moaning Muffet?